If you’re curious about building out a membership site, then you’re in the right place. At first glance, membership sites can seem tricky. You need to choose the right platform, tools, membership model, and payment options — and that’s all before you even start creating content for the site. If all that sounds overwhelming, don’t worry, we’re here to guide you every step of the way. Building a membership site doesn’t have to be incredibly difficult. As you’ll learn below, your site only needs three components to be a functioning membership site. The tools might differ, but the foundation will stay the same. 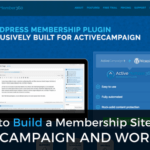 Below you’ll learn how to get started building your own membership site with the powerful combination of Ontraport and WordPress. If you already have these tools in your arsenal, then this is a great place to start. A platform that the site is built on. This can be WordPress or something else that will allow you to publish all of your site’s content and build upon it. A protection mechanism that will place your content behind a members-only firewall. Usually, your members will have to pay for access to it. Finally, you’ll need a way to control the design and layout of your site so you can create a way to present your course or membership content. Of course, access to Ontraport. 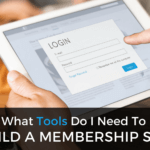 If you’re looking for a complete list of tools you can use to build out your membership site, then check out the post we wrote that covers exactly that. We believe that WordPress should be your go-to platform for the home of your membership site. It provides an unshakable foundation, so you can build out your membership site in any way you see fit. By integrating Ontraport and WordPress for your membership site, you can easily and quickly create a membership site without too much additional work. Plugins like AccessAlly and PilotPress let members sign up, and they even let you curate course delivery. Having CRM software like Ontraport integrated into your membership site lets you easily avoid hassles like dealing with missed payments and delivering course content in a timely manner. However, if you’re not currently using Ontraport as a contact management system, then it doesn’t make sense to use it for your membership site. Use one of these other ones instead. Ontraport is primarily a CRM and Email Marketing platform. However, luckily for you, they have a built-in membership integration so you don’t have to go and buy 3rd party products. This also means you can use Ontraport to manage the entire backend of your membership site. To connect Ontraport and WordPress, all you need to do is install PilotPress on your WordPress site and then create the varying membership levels to protect the site inside of Ontraport’s membership settings. With the PilotPress plugin, you can then protect pages that you only want members of a certain level to have access to, or you can also use PilotPress shortcodes to display different information to different membership levels on the same page. In order for users to gain access to your membership site, you’ll need to create a sign-up page or sales page. Then you’ll want an Automation attached to this sign-up process to then give the appropriate membership levels, generate the username and password and then email it to the new member. There are numerous examples of stellar membership sites that were created with Ontraport and WordPress. Below are some of our favorites you can gather inspiration from. Owners Academy is a course created to help people build a business they love. You’ll notice the course opt-in page is incredibly simple and nothing more than an email subscribe box with an offer for free business webinars. That’s it! The Restaurant Boss was a course created to help restaurant owners run a better business. You’ll notice that their website is very simple and includes an enticing headline, a list of benefits, and a simple call-to-action for a free video. Basic Bananas is a membership site that gives business owners a continuous supply of marketing wisdom. Their site is quite feature-heavy, but you’ll notice that once you click on the opt-in, you’re taken to an email landing page that eventually upsells the course. As you can see, the membership sites you can create with this integration are quite versatile. If you’re already using Ontraport, then this could be the perfect solution. If you need any assistance getting the technical elements of your membership site set up, then reach out to our team today.